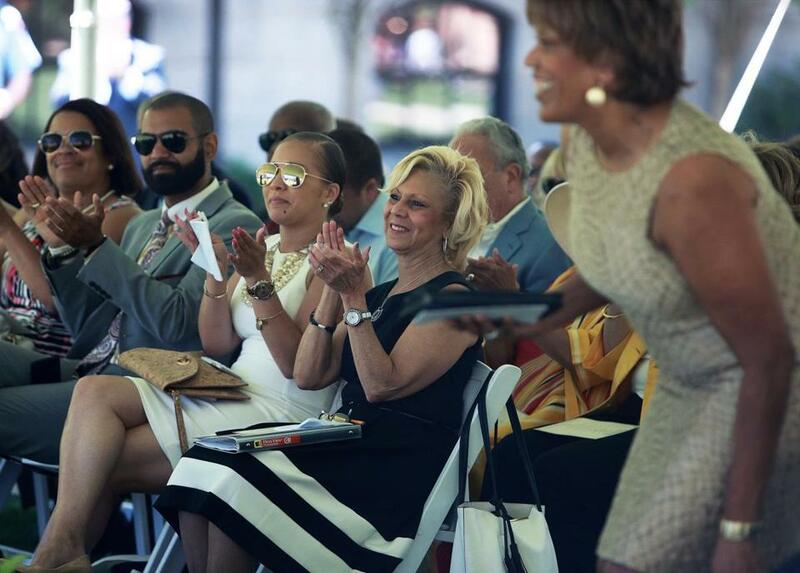 Barbara E. Edelin (center), widow of Dr. Kenneth C. Edelin, applauded as the Rev. Liz Walker (right) was introduced. Friends, family, and colleagues of Dr. Kenneth C. Edelin assembled on the lawn outside Boston Medical Center Thursday afternoon to dedicate a public square in his memory. His widow, Barbara E. Edelin, stood before the crowd and recalled how her late husband had wanted to become a doctor at a very young age, after his mother died of breast cancer. It was that personal mission that propelled Edelin to pursue a career in medicine and become the first African-American to be named chief resident of Boston City Hospital’s obstetrics and gynecology department. But his accomplishments aside, Edelin may be best known for having been at the center of a landmark abortion case that made headlines across the country, after he was convicted of manslaughter for performing a legal abortion at Boston City Hospital in 1973. He was ultimately exonerated in 1976 by the Massachusetts Supreme Judicial Court. After the trial, Edelin continued to build upon his success and hold prominent posts. He chaired the obstetrics and gynecology department at the Boston University School of Medicine and was director of obstetrics and gynecology at Boston City Hospital (now known as Boston Medical Center). He was also associate dean for student and minority affairs at BU’s School of Medicine, working to bring minority students into the school. Barbara Edelin recalled how he would ask medical students over to their house for pizza and invite students who lived too far away to go home for the holidays to join them for Thanksgiving dinner. Edelin died in 2013 at the age of 74. On Thursday, more than 100 people gathered under a white tent at Boston Medical Center to celebrate Edelin’s achievements and unveil a sign that will mark the intersection of Harrison Avenue and Worcester Square as Dr. Kenneth C. Edelin Square. Other speakers included Mayor Martin J. Walsh, City Councilor At-Large Ayanna Pressley, Boston Medical Center’s president and CEO, Kate Walsh, and Dr. Jennifer Childs-Roshak, CEO of Planned Parenthood League of Massachusetts. City Councilors Annissa Essaibi George and Tito Jackson and former governor Deval Patrick and his wife, Diane, were also in attendance. After the ceremony, Flash Wiley, a longtime friend of Edelin’s, reminisced about the times Edelin cared for him and his family when they were sick, and how Edelin went out of his way to help all of his patients. Bryan Marquard and Martin Finucane of the Globe staff contributed to this report. Emily Sweeney can be reached at esweeney@globe.com. Follow her on Twitter @emilysweeney.